Owner Stefano Enrico Sganzerla was born in a specialty food shop (literally) and so it is safe to say his destiny was sealed right from birth. 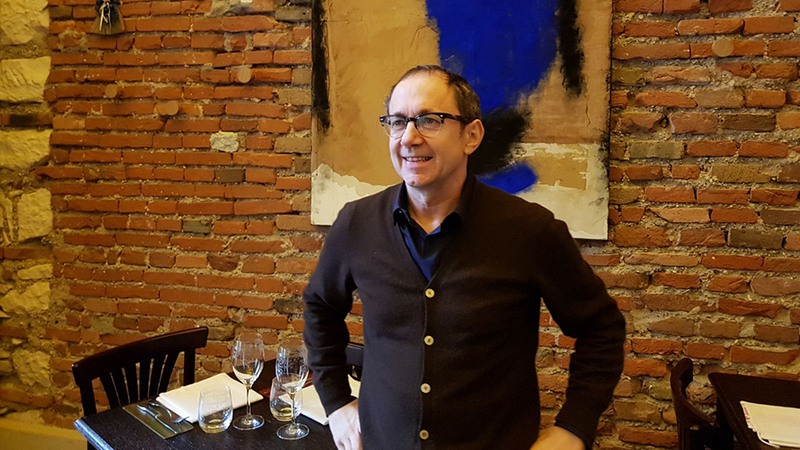 From childhood onwards, Sganzerla’s life-beat has hummed along notes of food and wine. In his youth, he began working in the specialty food store, and then at his father’s coffee bar. That job description was not in tune with the young man’s aspirations, and so Sganzerla decided to open a trattoria, which is how he eventually realized his heart was in haute cuisine. Sganzerlatook time off to apprentice in famous restaurants all over the world, including stints with Tony May at Palio in New York (well before San Domenico and SD26: my, how time flies! ), with Pierantonio Ambrosi at Villa Fiordaliso in Gardone Riviera, with Piero Selvaggio in Los Angeles, with Guido Morari at Caffè Dante in Verona and other local Veneto culinary luminaries such as Elia Rizzo (Il Desco), Giancarlo Perbellini (Perbellini) and Simone Lugoboni (Oste Scuro). Sganzerla followed all this up by becoming a partner in Verona’s well known Pompiere trattoria (still one of the city’s best) and then spent three years at another Veronese institution, the Bottega del Vino, which is now owned by the Famiglie Storiche a private association of some of Amarone’s best producers that includes Masi, Tedeschi and others. With Mondodoro, Sganzerla decided to take his passion for healthy food and drink to the next level. The restaurant focuses on food and wines made with few if any additives and a menu that is mindful of caloric content. Mondodoro, which takes its name from a modification of the name of the pretty little piazza it is located in, is a small osteria that can seats no more than forty people, In other words, book ahead, or you won’t get a table. And that would be a shame, for the cuisine is eclectic and interesting, solidly rooted in Veneto tradition but with twists and exotic touches, some of which, personally, I would go. Most importantly, Mondodoro boasts carefully sourced ingredients that are not commonly found in many of the city’s other trattorias. I have eaten numerous times at Mondodro over the years. My latest lunch ran like clockwork, as always. The tartare of arctic char with avocado hummus was lovely, and far better than my desire not to have avocado in my Italian dishes might have led you to think. The dish was delicate and well balanced, while the char was not at all overpowered by the avocado. Readers who are not fishermen or simply not as much into trout as I am (it’s my favorite animal in the world) and tend to get lost when confronted with different trout names at their fishmonger or dining spot might like to know a thing or two more about the noblest fish that swims. Trout and char are two very closely related fish (for the more one-track minded amongst us, think Nebbiolo and Nebbiolo Rosé). As a general rule of thumb, the easiest way to tell trout and char apart (but be mindful that most everyone thinks of them as trout indistinctly) is that the former have black spots and the latter have white spots. Anyways, a number of different chars exist. In Italy there are salmerino alpino, also known as salmerino di lago (Salvelinus alpinus, which is the arctic char of North America) that lives in Italy’s deep northern lakes, and the salmerino di fonte (Salvelinus fontinalis, known as the brook trout in Canada and speckled trout in the USA) which, in Italy at least, lives mostly in brooks and streams. The two fish couldn’t be anymore different. For one thing the artic char can reach a size that is easily four to five times larger than that of the brook trout. Restauranteurs and fishmongers don’t do us any favors by writing down just trout or char or salmerino without any other specifications, but it is what it is. The salient point here is that the two critters are delectable, some of the tastiest finned-creatures you’ll ever taste anywhere. I followed up my first appetizer with the asparagus, rocket and quinoa salad that may have been the best dish of the day, boasting a lovely crunchy texture and refined flavors. 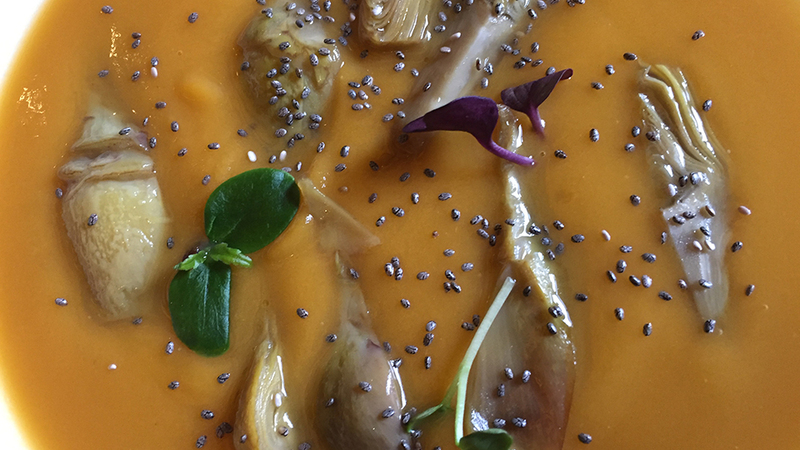 For those of you wondering what the dish called “crema di batate e castraure” is all about, batate in Italian refers to the American sweet potato (while the word patata, with a “p”, refers to non-sweet potatoes). Castraure are the first shoots of the artichoke, and while the term ought to refer especially to the violet artichoke of the island of Sant’Erasmo in the Ventian lagoon, it is now often used rather generically when dealing with any artichoke. Both the batate and the castraure are considered gastronomic delicacies in Italy. Mondodoro’s pastas and risottos are also top notch. You literally won’t go wrong with anything you choose from the compact menu (about four or five starters, and similar numbers of primi and secondi). 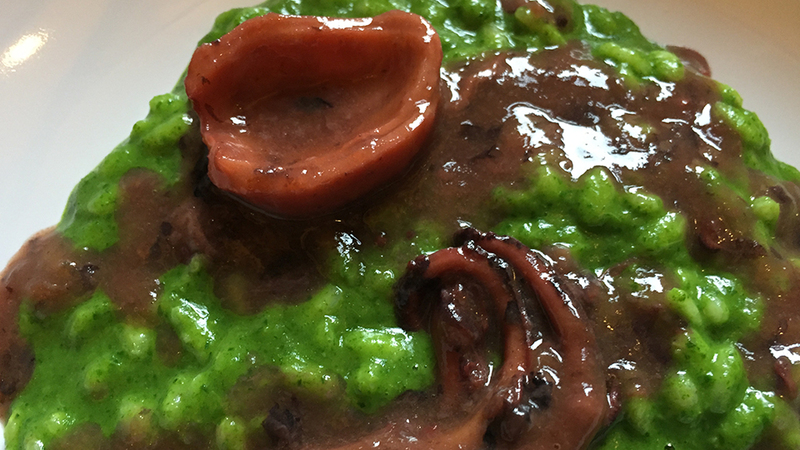 I will just mention that you have to like a touch of savoriness in your food, as that is a trait that I find recurring in virtually all the dishes I have tried at Mondodoro over the years. Mondodoro is a haven for natural wine lovers, which, depending on how knowledgeable the restaurant owner or their wine director are, can be a good or bad thing. I usually start to cringe when people want me to try natural wines because far too many are dirty or flawed. Fortunately, there are many vignerons and vignaioli all over the world who do know what they are doing and make well-balanced clean wines that are quite drinkable. At Mondodoro, where they know a thing or two about wine, bottles carrying the names of the likes of, for example, Gravner, Monte dei Ragni and Angiolino Maule hit all the right notes, admittedly, for those who like these wines. There are days when nothing starts off lunch or dinner better than a bright bubbly and so it was this time with our opening act, the NV Jeaunaux-Robin Extra Brut Eclats de Meulière. This is a good example of bubbly from the relatively less-known part of the Champagne Appellation of Vallée du Morin, just north of the Côte de Sézanne, characterized by the usual chalky-marly soils of the region, but that here have also noteworthy flint content. At once bright and fresh but also ripe and tactile, this very flavorful Champagne is a 60% Pinot Meunier, 30% Pinot Noir and 10% Chardonnay blend. This may not be the last word in refinement (the Pinot Meunier delivers size and flesh but perhaps not quite the elegance that Chardonnay might), but there’s a lot of Champagne in this bottle for the money. Well done. Even better was the absolutely stellar 2001 Giorgio Grai Pinot Bianco, from a recognized master of the variety. This wine in particular did not just showcase Grai’s talent to the fullest extent, but once again confirmed Alto Adige as a world-class terroir (perhaps the best there is) for Pinot Bianco (or Pinot Blanc, in French). 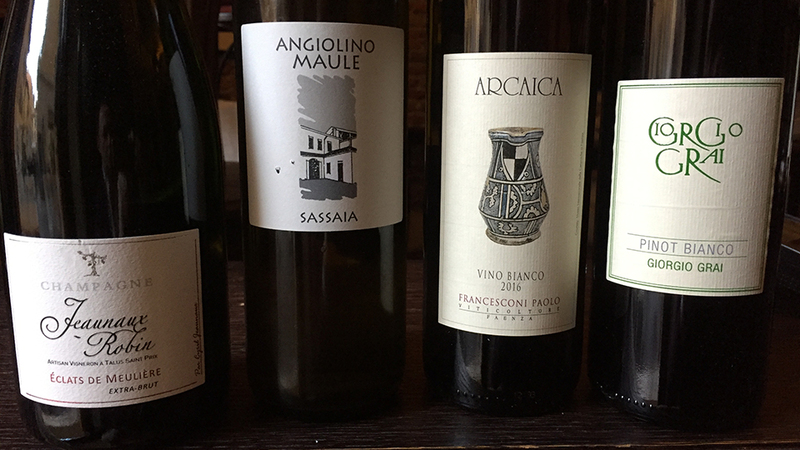 Both the 2016 Paolo Francesconi Albana Vino Bianco Arcaica and the La Biancara/Angiolino Maule Sassaia were deep yellow-amber in color, and boasted concentrated, rich, and thick aromas and flavors. The Arcaica is made by macerating Albana must on the skins for sixty days; the wine is vinified in stainless steel and amphoras (arcaica means old, ancient, or “in an ancient manner”, which refers to the way this wine is made). The La Biancara is a blend of 85% Garganega and 15% Trebbiano di Soave that is fermented in 30HL barrels and bottled unfined and unfiltered. Not surprisingly, the Albana proved the riper and rounder wine of the two, while the Sassaia was more piercing and dainty on the palate. Both were clean and precisely made. They also match very well with hearty fare (perhaps even better than with the delicate, nuanced cuisine served at Mondodoro). Readers who enjoy these wines will do well to look for bottles from Francesconi and Maule, two recognized for the start of the natural wine movement. 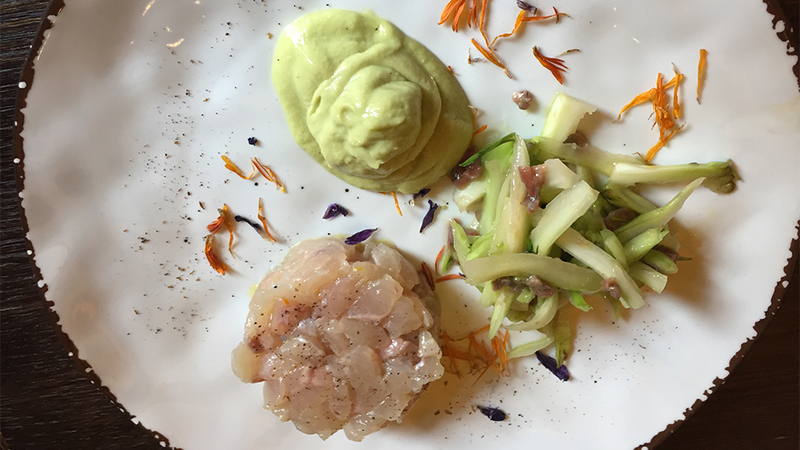 Tucked away in its bucolic little square hidden away from the bustling nearby downtown shopping streets, Mondodoro is one of Verona’s best dining spots and a perfect place to get away from it all and have a quiet, beautifully prepared meal.